In Between the Sunsets of Life: A Blogaversary Giveaway! Celebrating 2 Years of Blogging! A Blogaversary Giveaway! Celebrating 2 Years of Blogging! We have been teasing about a giveaway to celebrate our 2nd year of blogging here at In Between The Sunsets of Life! Before we jump into that, our family would like to say thank you for following our little piece of the blog world and sharing our posts. 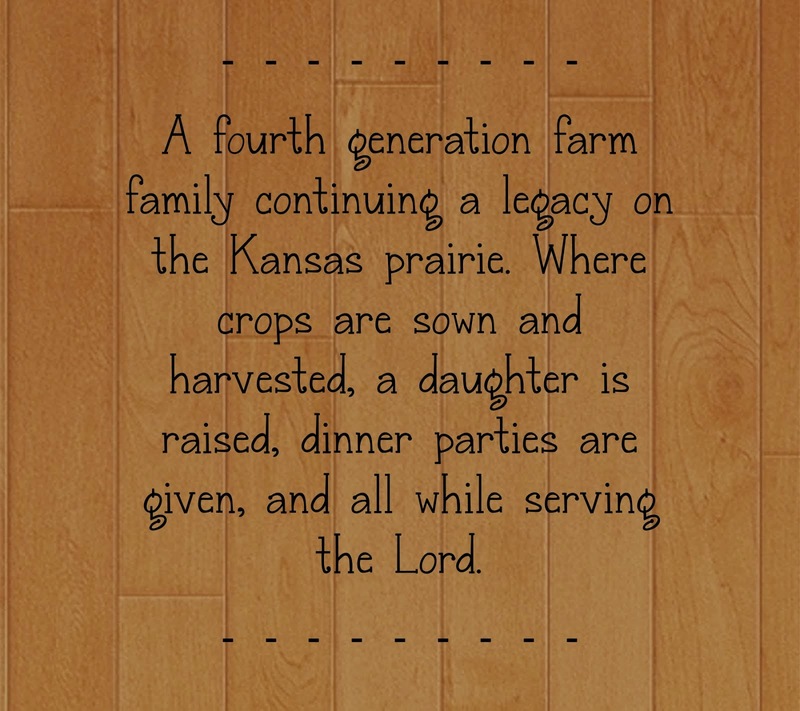 Life here on the farm is a wonderful experience, although full of lots of lessons! 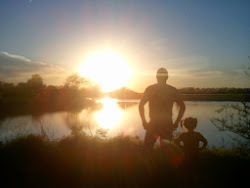 If we can help others or teach others about rural living than it's all worth the time and effort we put into this blog! Thank you! August 15th, 2014 marked our 2nd anniversary, due to family demands we pushed our celebration off until today! We will now reveal the giveaways! 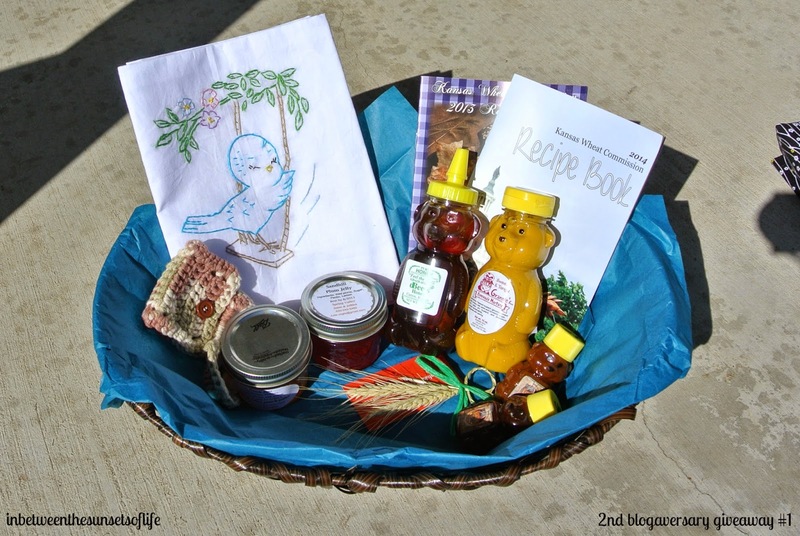 1st prize is a lovely basket of Kansas made or Kansas related items! Let's start from left to right shall we! Crotchet tea towel holder, Embroidery dishtowel, Kansas Wheat Commission Recipe books, Homemade Jam (by Julie), dBee's Honey, Grannie's Mustard, and Knackies BBQ sauce, and to represent our biggest crop we grow, a beautiful wheat decoration. The honey and BBQ sauce are our families all time favorites! They are made in our county and are the best of the best my friends! The cute wheat decoration was made by none other than my friend Nicole's family over at A Kansas Farm Mom! I didn't embroidery or crotchet the items but they were made by Kansas folk! 2nd prize is a sweet little bundle of Kansas yumminess! 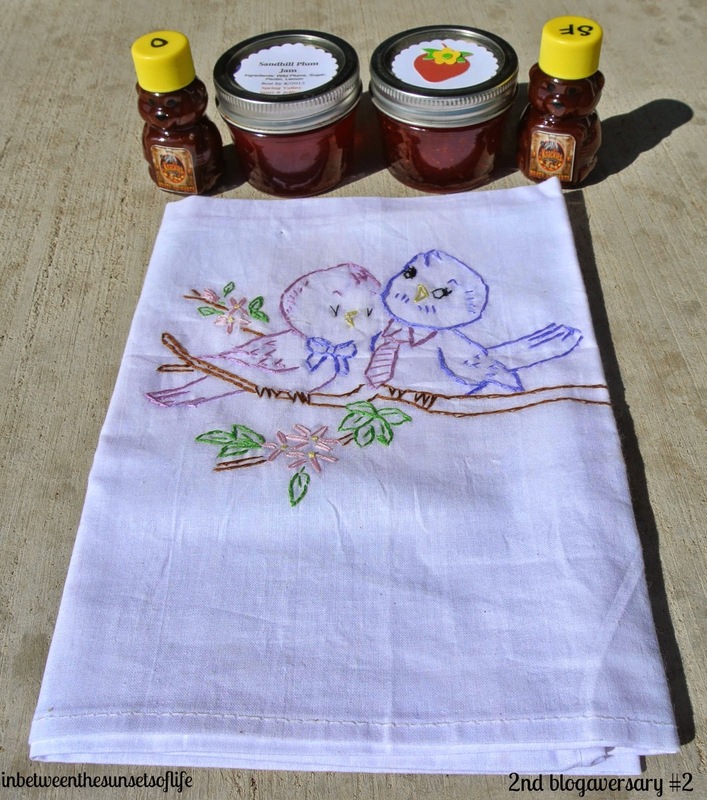 We have another lovely tea towel, yummy BBQ sauce, and two small jars of homemade jam! Sandhill plum and Strawberry! The 3rd prize includes a lovely apron that was sown by my middle daughter Kassidy. It is black, white and yellow and is a full apron. 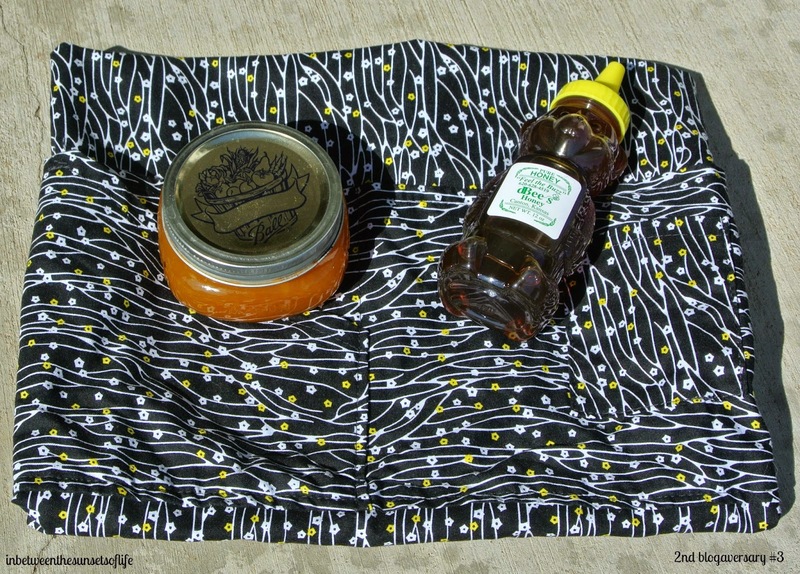 Along with it you will get to enjoy some homemade Peach jam and a sweet bottle of dBee's honey! All you have to do is the following, and you will be entered for the drawing! We will draw on Friday September 19, 2014 and announce the winner that day! So be sure to follow the steps, and the more things you do below, the more chances you have to win! Disclaimer: I will ship the prizes only within the United States and the basket in the first prize is for display only. It is not part of the prize. Once again, thank you for joining us and be sure like, share, and check back on Friday! Congratulations on two+ years of this adventure called blogging! Sweet!...and savory...and beautiful! Pick me little Rafflecopter man, Pick me! Ooo, and I like the "Find your favorite post and share it" idea! Congratulations Julie!! I read your posts all the time and think that is me but I don't blog so thank you again for continuing to do this! Michelle! Thanks for commenting & I appreciate the compliment! Glad I could bring some joy to life! Have a great day! I didn't either Laurie! Sweet! :) Thanks on the prize ideas! I came across your blog via my niece, Laurie Link. I also enjoy your posts, and am sure I would have never stumbled upon it, had it not be for Laurie. Deb, Welcome to our blog! I am glad that Laurie led you our way! She's a sweetheart & a pure joy to be friends with!